DETROIT -- Detroit Red Wings forward Gustav Nyquist seems to be back where he was during a two-and-a-half month stretch last season. The 25-year-old right wing from Halmstad, Sweden, has goals in each of the Red Wings' first two games this season, which Detroit split. That comes following a season in which he led the Red Wings with 28 goals; he also had 20 assists in 57 games. Nyquist and the Red Wings host the Boston Bruins on Wednesday at Joe Louis Arena in the Wednesday Night Rivalry game at 8 p.m. ET (NBCSN, TVA, SN1). It will be the second game between the teams in seven days. 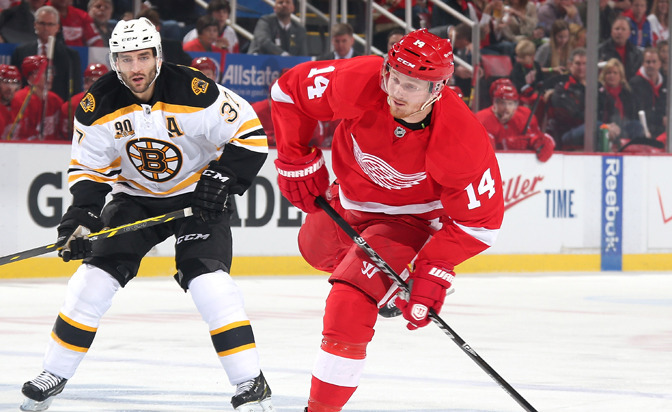 The Red Wings earned a 2-1 win against the Bruins in their first game of the season last Thursday in Detroit. Nyquist scored the winning goal via the power play with 5:14 left in the second period. "He's got that knack, nose for the net. He's always in the right place at the right time," Red Wings goaltender Jimmy Howard said. Nyquist spectacularly demonstrated those traits during a torrid stretch from Jan. 20-April 2 last season, which accounted for most of his production. He scored 23 goals in 28 games and had 11 assists during that span. Detroit had the second-most man-games lost to injury in the NHL last season, including long absences by Pavel Datsyuk and captain Henrik Zetterberg. Nyquist's surge was a big reason the Red Wings were able to slip into the Stanley Cup Playoffs by earning the Eastern Conference's eighth and final spot, which extended their streak to 23 consecutive postseason appearances. But Nyquist managed two assists in the last six regular-season games and was held pointless by the Bruins, who defeated the Red Wings in five games in the Eastern Conference First Round. That added up to 11 games without a goal and it carried over into the preseason, when Nyquist failed to score. But it's now clear he still has his goal-scoring touch. "That's why we have a preseason too. You want to get into things," Nyquist said. "You haven't been playing for three, four months, so it's nice to get a few games in before you start up but it's nice it's started now." Nyquist's goal in a 3-2 loss against the Anaheim Ducks on Saturday was a sublime display of his talents. After taking a pass from Zetterberg, Nyquist sped down the left wing, faked a slap shot from the top of the circle and then beat Anaheim goalie Frederik Andersen with a wrist shot high on the far side. Nyquist played in 57 NHL games last season because he started with the Grand Rapids Griffins in the American Hockey League despite being one of the Red Wings' top 12 forwards late in the 2012-13 season, in the ensuing playoffs and following preseason. But Detroit unexpectedly re-signed Daniel Cleary early during that training camp and it left the Red Wings with more forwards than they could keep. Nyquist was the only forward eligible who could be sent down without having to clear waivers. Obviously, he would have been immediately snapped up by another team and the Red Wings certainly wanted to keep him. Detroit's offense sputtered early last season and Nyquist was recalled in late November. He wasted little time in showing the Red Wings what they had missed by scoring 17 seconds into his first game back, and he scored again in a 4-3 win against the Carolina Hurricanes last Nov. 21 at Joe Louis Arena. After that, the University of Maine product was in the League to stay. "He finds way to score goals," Zetterberg said. "I think he had a tough preseason but now when it matters, he comes through and scores goals."